The Round 2 Statewide Super League, Reserves and Torrens Uni Cup U18 Teams are in, check them out below. 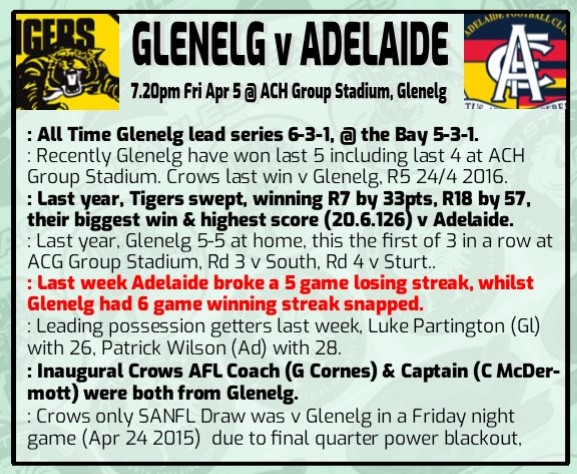 Glenelg has been dealt a major blow for its midfield battle against Adelaide on Friday night. Delisted West Coast Eagle Luke Partington tweaked his hamstring at training earlier in the week, with club medicos not prepared to risk further damage against the Crows. Tall midfielder Tom Schott, goalsneak Josh Koster and defenders Alex Martini and Rulla Kelly-Mansell have been included in the 23-man squad. Recruited from Launceston FC, Kelly-Mansell (26, 187cm and 76kg) finished with 21 disposals and seven marks in the Reserves last Friday night. Bailey, Boyle, Carmody, Carney, Davis, DiSotto, Emmett, Feely, Gamble, Holyoak, Kerrish, Leck, LeCornu, Lovelock, McDermott, Milera, Searle, Snook, Yates, Virgin. Adelaide has lost lead ruckman Reilly O’Brien for its Friday night clash with Glenelg. Called up to replace Sam Jacobs in the Crows’ AFL line-up, O’Brien will have his role taken by Paul Hunter, who will spend most of his time starting in the centre square. Development players Jordan Boyle, Mitch Johnson and Michael McMahon have been added to the 23-man squad, with all three named on the extended interchange bench. Crows look to have too much depth unfortunately. Not having Snook and Partington hurts in the middle where we have to match up against CEY, Greenwood, Wilson & Poholke. Add the advantage of having a full squad of AFL listed players on a Friday night and I think the Crows will win by 2 goals. Glenelg playing really well. McBean 6 goals so far. Haven't watched it all, but haven't seen one free kick to Crows so far, lots the other way. Not affecting result. Impressive effort. Bays looked good overhead from what I saw. Admin wrote: Glenelg playing really well. McBean 6 goals so far. Haven't watched it all, but haven't seen one free kick to Crows so far, lots the other way. Not affecting result. Final count 36 to 14!!!!!!! Are there different interpretations in the SANFL compared to the AFL? Their reserves players don't know exactly what is right and wrong in the SANFL? That's an impressive win from the Bays minus arguably their two best midfielders, looking very good at this stage to living up to the expectation most had of them returning to a legitimate contender. I posted the free kick count to back up my observation that in the patches of the game I watched, I didn't see Adelaide get a free kick, while the Bays got several. As for the game, it didn't make much difference, the Bays were very impressive, as I posted, and were far too good.